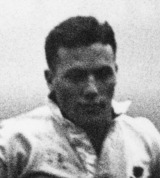 Babrow played five Tests for South Africa in the centre during 1937, inspiring them to a famous victory over New Zealand in Auckland in his final appearance. A doctor, Babrow later studied at Guy's Hospital in London and turned out for their rugby team. Following the outbreak of World War Two he joined the medical corps and served with distinction at Dunkirk, North Africa and Italy and was wounded at El Alamein. He was decorated with the Military Cross and mentioned three times in dispatches. Upon the end of fighting he returned to South Africa and enjoyed a long medical career, also proving to be a vocal critic of the apartheid regime. He was the second Jewish player to represent South Africa, following his cousin Morris Zimmerman.